While people have long loved gathering in arenas and around televisions to root for their favorite sports teams, events like the NCAA basketball tourney remain one of the few in a rapidly changing media landscape that still attract a broad and diverse viewership. Because of this, March Madness, even beyond one’s busted brackets, is one of the few spaces where we can all participate in a shared story unfolding in real time. The thrilling journeys of Villanova University (men’s champions) and the University of Notre Dame (women’s champions) to ultimate victory in the Final Four inspired many viewers, but another team might have brought more important insights to university communities. The unlikely journey of the Loyola Chicago Ramblers participates in something larger: a national conversation where, for three weeks anyway, we are all invited to consider what counts when it comes to personal, communal and institutional values in contemporary culture. In this sense, the NCAA tournament showcases not only athletic excellence, but also moral and spiritual character—and in subtle ways, the pedagogical commitments and objectives of universities. We see excellent young people in school colors competing in demanding moments. But who are these universities they are fighting for? What are their histories and missions? What do these places stand for and how might student-athletes be living out these values on the broader stage? Do these questions even make sense in 2018? The unlikely journey of the Ramblers invites us to consider our personal, communal and institutional values in contemporary culture. It is my distinct privilege to work at Loyola University Chicago, where I appreciate the school’s integral approach to living and learning in the Jesuit/Ignatian tradition, including the emphasis on the dynamic relationship among faith, reason, and justice—an approach to educating the whole person that is close to 480 years old. But what about the men’s basketball team at Loyola? Are they part of this troika of faith, reason and justice? On the faith end, "Sister Jean" has become a household name. There could be no more worthy celebrity in times like ours. Sr. Jean (Sister Jean Dolores Schmidt, BVM) has cultivated a sense of prayerfulness and spirituality in the men’s team (and, with her congregation, well beyond) in ways that have become legendary. The Loyola campus ministry team also leads yearly retreats for all of our sports teams and for all of our students. As a former basketball player, it has been my honor to lead a pair of men’s basketball retreats (at the request of Sister Jean and my colleagues in campus ministry). Such retreats provide support and resources not only for those who have a developed faith life, but for those who are seeking, or who have never had an inkling to think about such things. Ignatian spirituality is excellent in meeting people where they are, and the increase of this kind of literacy is a vital component in Jesuit education. I have many student-athletes in my courses at Loyola Chicago and am impressed by their intelligence and effort—and writing this sentence reminds me that I need to respond to an academic advisor’s email with an overdue update on men’s basketball players’ grades. But that is less about sending up warning flares or showing special treatment than it is about perpetuating a culture where academics is taken seriously. Eleven of Loyola’s athletic programs have perfect graduation rates, there are scores of student-athletes on the honor roll, and the collective G.P.A. for Loyola student-athletes is in at an impressive B+. In the classroom, they have the chance to ponder and navigate through difficult questions, not only about faith and reason, but about the third element in the Catholic, Jesuit education trifecta: justice. It is perhaps here where things get the most complicated—and the most promising. Educating students for justice can be slow going, and there are too many injuries to it in our nation and world for which to properly account. 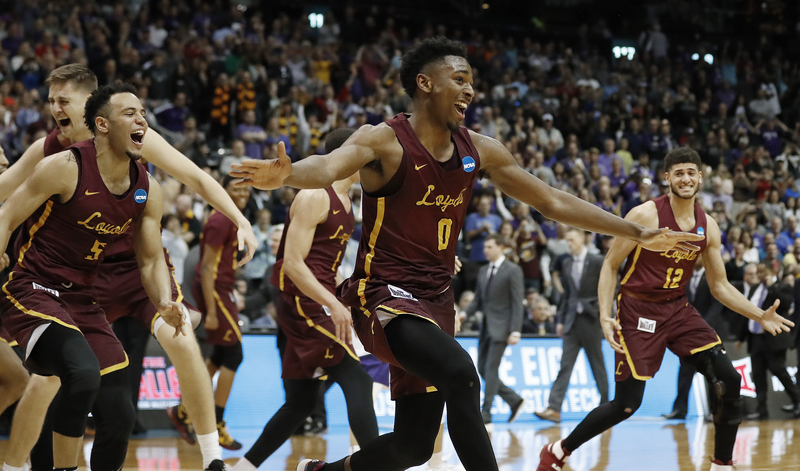 But Loyola’s March Madness run amplified attention on national questions having to do precisely with dignity, hospitality and moral citizenship, three key components of social health. For example, Loyola’s 1963 men’s basketball national championship team connected with our 2018 squad—particularly under the category of social justice in the Catholic and Jesuit tradition. In 1963, the Ramblers acted courageously in the face of institutionalized racism, advancing the cause of the civil rights movement significantly in one fateful game. It is my hope that our 2018 team—and Loyola Chicago’s place on the national stage—not only shines a light on the prophetic voice of the 1963 squad, but also raises awareness about a related issue so important to the LUC community: justice for DACA students and their families. Loyola’s March Madness run amplified attention on national questions having to do precisely with dignity, hospitality and moral citizenship. In a sad coincidence, Felix García, the father of LUC medical student, Belsy García Manrique, is set to be deported on April 4th, the same day 50 years ago that Dr. Martin Luther King, Jr. was assassinated for organizing for the common good and speaking truth to ignorance and power. The plight of Mr. García and his family merits the attention of all Americans; the racist status quo that reigned in 1963 seems so distant to us today, or so we think. Why then, as a nation constituted largely of immigrants, do we repeat the errors of that era and enshrine them in unjust laws and policies? If the many ways American culture was on the wrong side of history in 1963 are crystal-clear to us today, our expressions of latent tribalism and the failure to tackle immigration issues with real-world insight and Christian humanism reveals a defect in our communal will, an intellectual and spiritual paralysis that ought not stand. When thinking about big-time sports, many Americans don’t want to make such leaps. They want to keep politics, religion and culture out of the games—even if they find themselves pausing reverently for prayer or cheering ardently when fighter jets pass over stadiums. Can we ask ourselves why a Bears-Colts game is an occasion for the military to flex its muscles, or why sport is the most popular liturgical experience in the world? The spectacle of sport, like liturgy, discloses our explicit aspirations and implicit fears in dramatic fashion. But what if other values were also exalted and amplified—like solidarity, generosity and reconciliation? The answer, of course, derives from a shared sense of values. The spectacle of sport, like liturgy, discloses our explicit aspirations and implicit fears in dramatic fashion. But what if other values were also exalted and amplified—like solidarity, generosity and reconciliation? What if, like Sister Jean (who helped to establish the MAGIS scholarship for undocumented students at LUC), we saw collegiate athletics as but an extension of the classroom, another venue for helping young people to learn and grow? And what if we saw that extended classroom as a place where faith, reason and justice might be placed in creative conversation and fertile tension? What might this mean for a world so desperately in need of renewed models of humanity and citizenship? The success of the Loyola Ramblers this year can teach us many things. We will travel far when we spread the court, care for our teammates, respect our opponents, listen to our coaches, explore both the inside and the outside, pass with creativity and care, play good defense, never give up, and honor the wisdom of spiritually wise women religious who are half our size and who show us how to worship, work and win. Why then, as a nation constituted largely of immigrants, do we repeat the errors of that era and enshrine them in unjust laws and policies? If the many ways American culture was on the wrong side of history in 1963 are crystal-clear to us today, our expressions of latent tribalism and the failure to tackle immigration issues with real-world insight and Christian humanism reveals a defect in our communal will, an intellectual and spiritual paralysis that ought not stand. This was an article supposedly about sports but it had to get political. Last year we admitted about a million immigrants, mainly from Mexico, China, India, the Philippines, El Salvador, Vietnam, Cuba, Korea, and other countries in the Western Hemisphere. How is that unjust or tribal? The answer it is not. Since 1965 when the immigration laws were changed there are about 80,000,000 people now living in the United States who are the result of legal immigration. Currently there are about 60,000,000 people in the country who do not speak English in their home as their main language. This is an indication of what has happened. The author should investigate the situation before writing critical attacks. I understand what he was saying based on the words he used. He used the words unjust and tribal and other negatives which are completely at odds when describing our current legal immigration system. I was pointing out the irrelevancies of his arguments based on using those terms by listing who are the legal immigrants. The author doesn't seem to like our current laws but he has not justified changing them with anything sensible. It certainly cannot be justified based on the reasons he gave. He also disparaged those who disagree with him that want fair and orderly legal immigration that will help the current citizens which are quite varied. The fact that Felix Garcia's daughter is s medical student should have no bearing on a court decision. She has no special pleading just because she is a medical student. From what I understand she is still at Loyola and getting her degree. Until we start obeying the laws, all these ad hoc emotional appeals will only prolong sensible decisions. Trump proposed a merit based system. Maybe if the Democrats helped pass it, Ms Garcia might get citizenship and with that, then her father. The team at Loyola is mostly black and blacks have been hurt the most by both legal and illegal immigration. I find it ironic that the author is using blacks and their achievements as an argument for something that has in the past and will continue in the future to hurt blacks as a group. Thank you- that needed saying! I am glad that Loyola-Chicago does an excellent job with their atheletes. made it to Champtionship Game last year - East Coast Bias ? If the student basketball players were recruited by Loyola for their athletic prowess and are on scholarship, then they are likely playing basketball to meet the requirements of a tuition free college education. Fail to play; lose the scholarship. The writer of the piece has concluded, without producing any evidence or testimonies from student sthletes, that the players are dedicated to affirming Catholic values through sport. I think a more realistic assessment is that a successful series of wins at any particular sport in college may lead to a lucrative post college career for the student and good publicity for the college to attract more student athletes and more donations from alumni. College marketing materials demonstrate the prestige factor attached to sports. The segue to a religious sister who established scholarships for DACA students is an appeal to emotion that neither affirms sport as an expression of Catholic values or the benefits of competition. As you are here to generate the nba live mobile cheats online we can know here the way to get the coins for free. Michael P. Murphy directs the Hank Center at Loyola University Chicago.